Here is a very scary story that details the potential for new government taxes (levies or fines) through compulsory, tracked, recycling. Citing the British model, Cleveland, Ohio, is taking a giant step toward a similar scheme of compulsory recycling, says Wendy McElroy, a research fellow at the Independent Institute. * In 2011 some 25,000 households will be required to use recycling bins fitted with radio-frequency identification tags (RFIDs) -- tiny computer chips that can remotely provide information such as the weight of the bin's contents and that allow passing garbage trucks to verify their presence. * If a household does not put its recycle bin out on the curb, an inspector could check its garbage for improperly discarded recyclables and fine the scofflaws $100. * Moreover, if a bin is put out in a tardy manner or left out too long, the household could be fined. * Cleveland plans to implement the system citywide within six years. Although you would be shocked to read about legislation forcing pubs to sell only low alcohol beer, you wouldn't be surprised. But this story is even stranger. In 2011 bars and restaurants in Colorado will be banned from the sales of such products. As the happy-hour crowd began trickling into The Celtic Tavern on Tuesday night, bar owner Patrick Schaetzle — flanked by placards and mirrors touting Murphy's Irish Stout — got some unsettling news. Sometime next year bars will have to stop selling his Lower Downtown pub's signature stout along with an array of other beers that are lower alcohol. I deliberated over whether to title this post "It's a bit late now" or "It's never too late". Ex UK minister in charge of narcotics policy has decided that all drugs should be legalised. Shame he didn't come to this conclusion - or at least act on it - while he was in charge. But from someone in his position and with residual influence on public opinion, his revelation is better late than ever. "The war on drugs does not work. We need to be bold, we need some fresh thinking," Ainsworth, who was also Defence Secretary in the former Labour government, told BBC radio. "This has been going on for 50 years now and it isn't getting better. The drugs trade is as big and as powerful as it ever was across the world." Ainsworth said each drug should be examined on its own terms and there should be different regimes for each one. Heroin should be legally available, but only on prescription, he suggested, while cocaine could be available from legal sources such as doctors. "I'm not proposing the liberalisation and legalisation of heroin so we can all get zonked out on the street corner," he said. "What I'm saying is heroin needs to be taken out of the hands of the dealers, put into the hands of the medical profession, done in a mass way to the extent that's necessary." There was a time when I kept my views about decriminalisation quiet. People think you are mad when you suggest legalisation of all drugs. But over time it becomes clearer and clearer that the madness is in the status quo. The first thing I note is that the complaint is unsigned. Which immediately raises my hackles - like bloggers and commentors who hide behind anonymity to carp and criticise. The next is the pedantic detailing of times. The aggrieved writer must be writing them down. They seem a little early as I usually only wake Sam at 7 but they are thereabouts. However, to describe after 7am as "very early hours" is silly. On a week day - the only time I walk Girl at that time - anyone working or attending school is up and about. Then the "continual barking". Girl, a trained heading dog, gets very excited about her walk and yes, she does bark "madly" from the door to the gate when she quietens down as she goes on the leash. So she barks for a few seconds. She is not out of control. 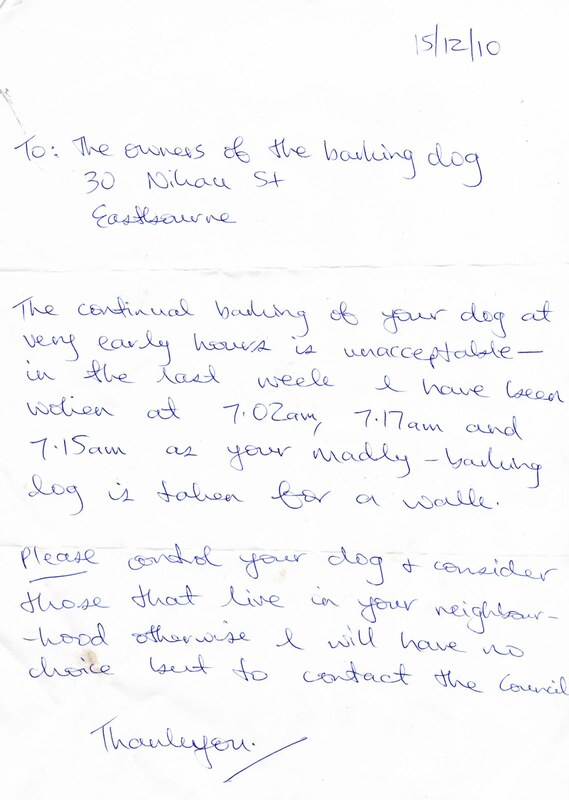 But as the writer is threatening a complaint to the council, I wonder what "continual barking in the very early hours" will infer? 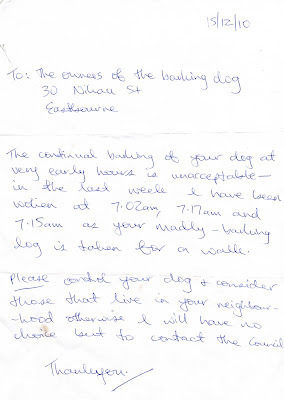 A dog left alone to bark constantly at one or two in the morning? That would probably provoke an unnecessary and unwarranted investigation. Then I consider the line about having some consideration for others in the neighbourhood. Having put an anonymous note in my letterbox I am now wondering who I have upset. Is it a newcomer or a neighbour I usually get along with? The writer has cast suspicion over the other neighbours by refusing to sign their name or talking to me personally. In my book that is a more anti-social action than my neglecting to shut my occasionally barking dog up. I will endeavour to do so by putting her on the leash before she exits the house. But I now face the unpleasant experience of setting off on our walk wondering who is disapprovingly watching us from behind twitching curtains. Perhaps I will set off today loudly singing "Joy to the World...."
Welfare, including Super, accounts for one third of expenditure. 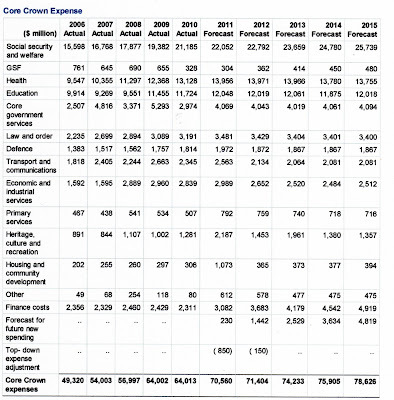 In 2006 Treasury forecast welfare expenses in 2010 would be $18.975 billion. 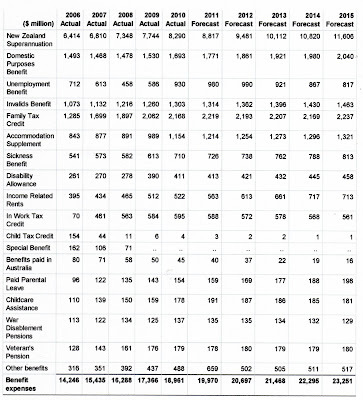 They under-forecast welfare by over $2 billion. 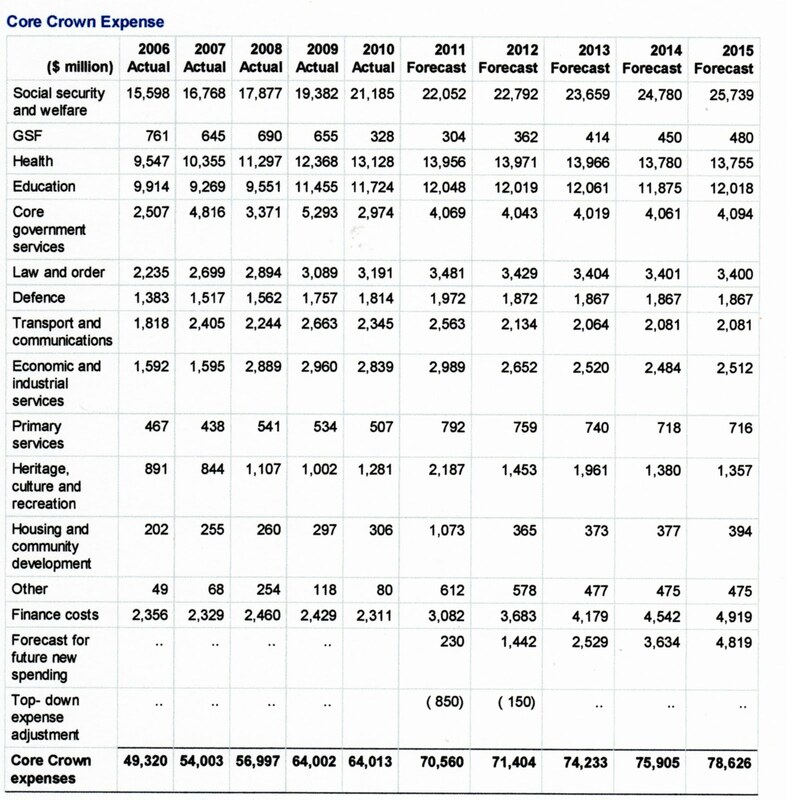 If all of the expenditure that relates to working age welfare is totalled the sum is $9.379 billion. 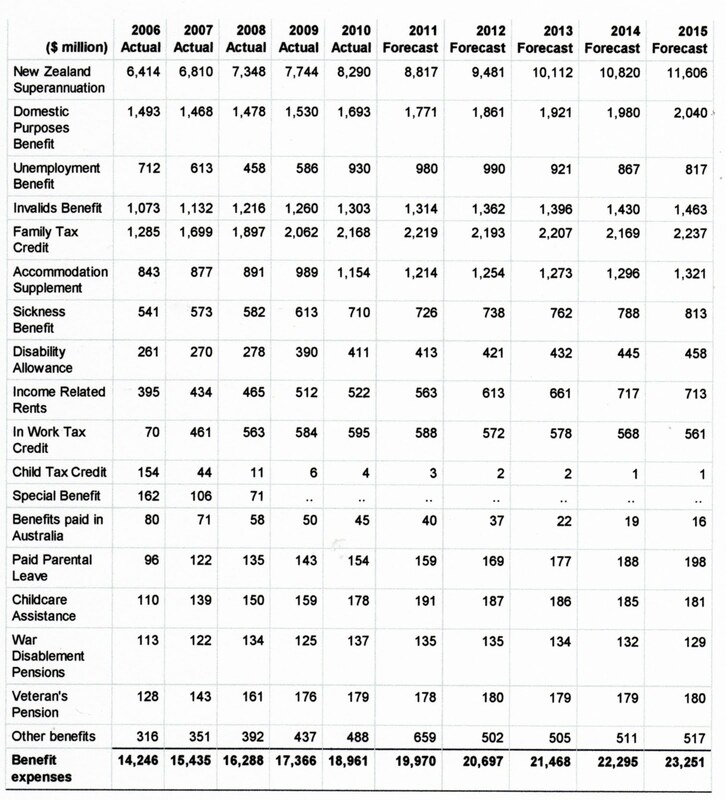 Divide that by the number of working age beneficiaries at June 2010 - 333,000 - to get an average sum of $28,165. That figure will be slightly high as a small percentage of the accommodation supplement and other allowances are received by Super annuitants or non-beneficiaries, so let's conservatively call it $27,000. Now I know I am labouring a point here but an average income of $519 per week does not describe abject poverty. The Sue Bradford group wants New Zealanders to believe that current benefits of $194 a week for a single adult or $366 for a sole parent with one child are "simply too low to live on". Her numbers do not reflect reality. Some individuals may be living on basic benefits but the resulting call is for all beneficiaries to receive an increase. If the problem is inaccurately described, so is the solution. Now Tapu Misa is beating the give-the-In-Work-tax-credit-to-beneficiary-families drum. And more generally, reducing child poverty requires more robbing Peter to pay Paul. The first demand will not be met. It wasn't met under Labour. And it sure as heck isn't going to be met under National. Lifting the income of families with children can be addressed through work, or through benefits. If it is done through the benefit system then the result is large numbers of workless households. If it is addressed through paid work, the goal of the Welfare Working Group, the result is a better economy and the re-establishing of personal responsibility as a common value. Children in families with work do better than children with families on benefits despite both being on low incomes. Children in families that work suffer the least abuse or neglect. Children in families that work grow up with similar expectations for themselves. But I have said it all before. Question that Tapu Misa might like to address in some future column. Asian children are the poorest in New Zealand. They must be because their parents have the lowest incomes. Why aren't they beset with educational failure, poor physical and mental health and headed for drug and alcohol problems? Asians have the lowest median incomes from all sources yet also the lowest incomes from government transfers. What is that telling us?